Modifiers are used for the modification of the (Al+Si) eutectic of aluminum-silicon alloys. Adding sodium or strontium to hypoeutectic and eutecticaluminum-silicone alloys improves the mechanical properties and the quality of the castings. A wide range of modification products are available for foundries and are introduced to the melt as a powder, a granulate, tablets or as pure metals or master alloys. The classic modifier is sodium which is either introduced to the melt as a metal or through salts which give off sodium as a granulate or tablets. Vacuum-packed sodium can be purchased in the form of air-tight aluminum cans or in foil. Salt mixtures, pressed as tablets or broken into granulates, are widely used in modification. The tablets are available for both standard dipping applications with the bell and for use with dipping cages in connection with a rotary treatment (see Rotary degassing). Modification tablets with aluminum grit and/or magnesiumchips which react exothermically have proven to be especially popular. The sodium in the tablet is released very quickly, in contrast to the tablets which do not react exothermically, for which the risk of localized over-modification in the melt is higher. Modern salt mixture granulates can be introduced to the melt surface without releasing dust into the atmosphere, particularly in the vortex which forms during rotary treatments. 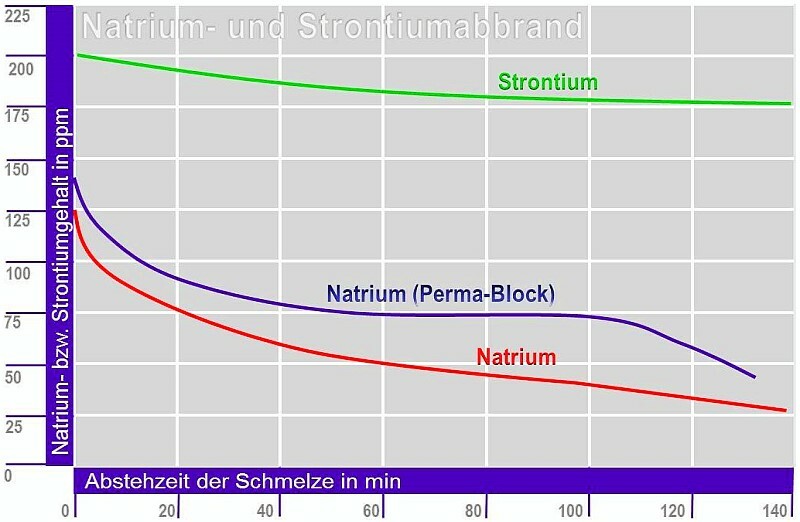 While long-term modification can be achieved when using strontium, sodiummodification is less durable. This wears off considerably after around 30 minutes and completely after one to two hours; re-modification is then necessary (Figure 1). In order to maintain sodiummodification, the foundryman often uses so-called perma blocks which are melted salt blocks or salt pellets and are placed on the bath surface of the melt. Modification with strontium, also known as permanent modification, has advantages due to the higher melting and evaporation point of strontium compared to sodium. Strontium burnout is therefore lower and the melts display a slightly lower oxide content. Strontium-modified melts show a metal stream which displays a thinner oxide covering than sodium-modified melts. Furthermore, the melt absorbs less gas and oxides during mold filling. In casting foundries, pure strontium metal is seldom used for modification, instead AlSr master alloys with 3.5 and 10% strontium are usually used. Master alloys with higher strontium contents contain inner-metal bonds of aluminum and strontium which do not have a modifying effect. These have a high melting point and exist as a separate brittle phase in the soft cast structure matrix. 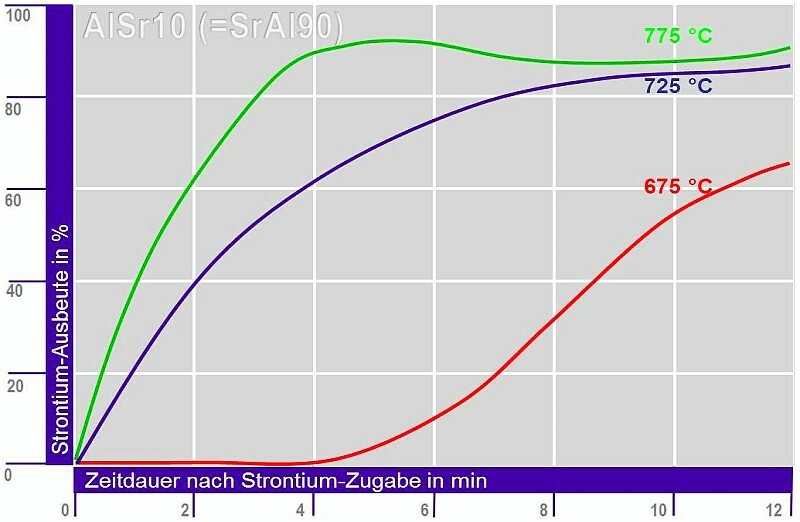 The 3% to 10% master alloys therefore ensure the best possible incorporation of the strontium, especially at higher melting temperatures, as they react endothermically in the melt (Figure 2). 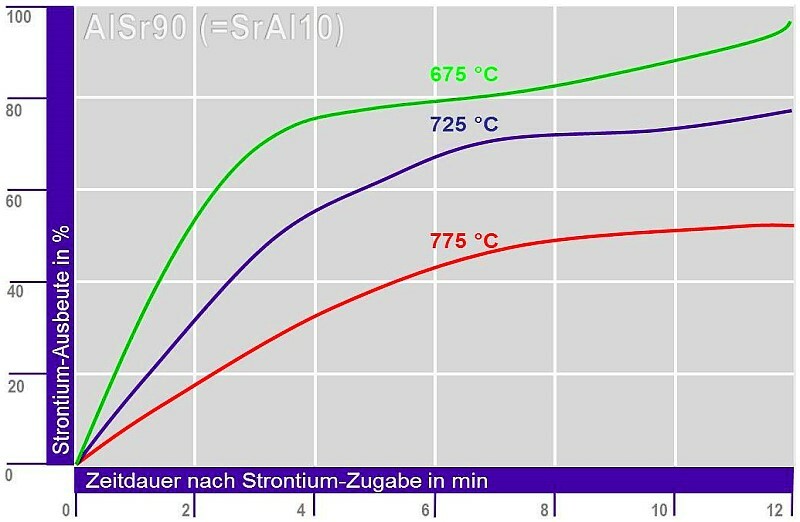 SrAI master alloys with 90% Sr and 10% Al – packed in aluminum cans – have a lower melting point of 580°C and react exothermically in the melt at temperatures of 650 to 700°C, meaning that a higher recovery is achieved at lower melting temperatures (Figure 3). Strontium modification is not only used in gravity die casting but also in die casting and sand casting. When used in sand casting, the water content of the betonite-bound mold sand must not exceed 3% as a higher amount of hydrogen absorption may occur due to strontium-modified alloys. Here, the different betonites also display different water vapor development when flowing into the melt. The Sr contents should also not exceed a value of 250ppm. Antimony is not a classic modifier. In AlSi alloys, it has a negative effect for contents of 30ppm and above – the lamellarcasting structure which is unfavorable for casting is stabilized, however, this is isolated and, in particular, is still desired in wheel casting. The sodium and strontium modification is disrupted as antimony, sodium and strontium precipitate in the melt. Even magnesium is precipitated in an inter-metallic phase if antimony is used and is then no longer available for artificial aging. product information sheet Veredelungsprodukte, www.foseco-foundry.com, 2011. Aluminum based master alloys, KBM Affilips B.V., kbmaffilips.com/aluminium_based_en.html.